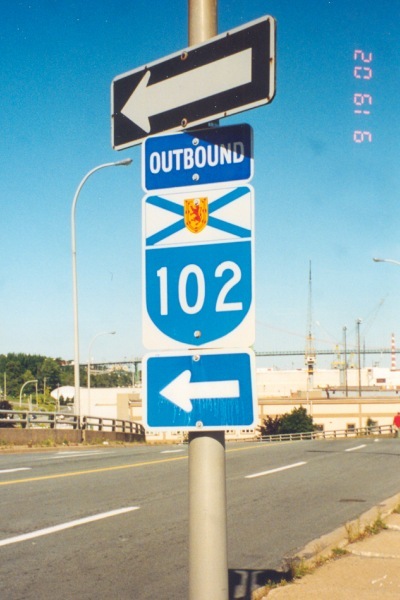 These are the highway-related pictures I took during a port visit to Halifax, Nova Scotia in September, 2002. Didn't get very far, but I did get out between the navy base (where we ported) and downtown. 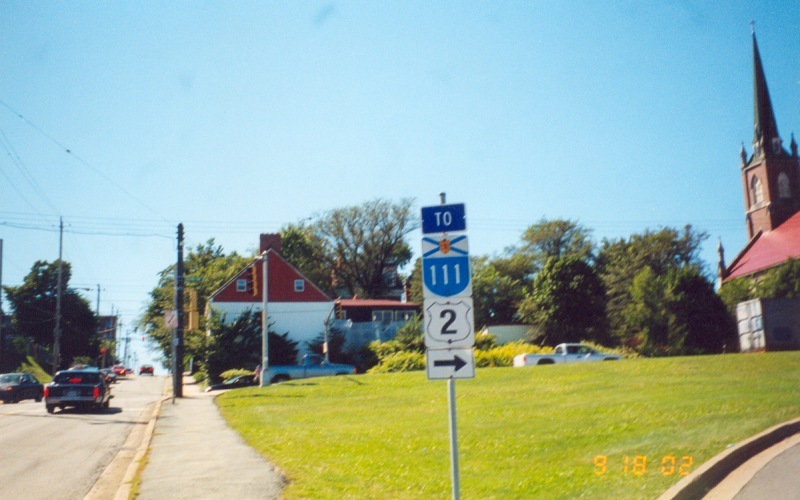 Trailblazers for the Route 111 expressway as well as Nova Scotia Route 2. This sign is located at the intersection of Cornwallis St and Barrington St.
Gore signage at an interesting urban interchange along Barrington St. Nominally a 3/4 diamond (missing the traditional NB on-ramp), this interchange involves Barrington St exiting onto itself, as well as Hollis St (SB thru traffic), Lower Water St (NB thru traffic), Upper Water St, and Cogswell St. 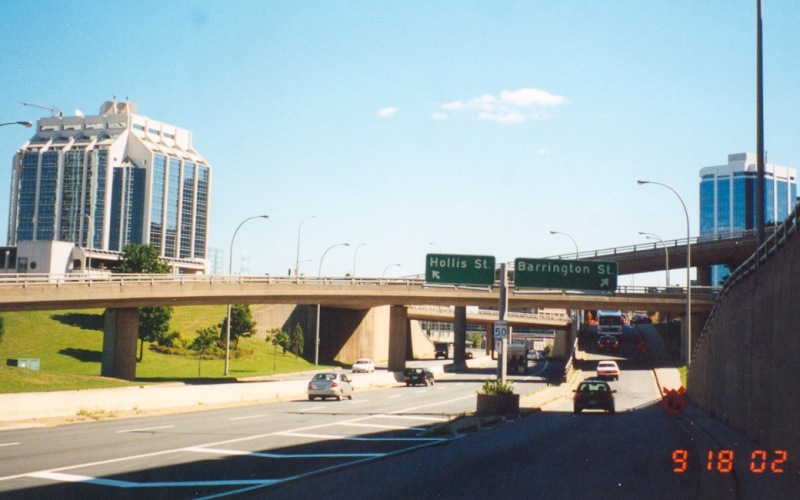 The "flyover" pictured is the sole NB on-ramp, and takes traffic from Cogswell St to NB Barrington St.
An "Outbound Route 102" trailblazer, directing traffic on NB Barrington St to turn left onto Cogswell St to get to Route 102. The "bridges of Halifax", as viewed from my ship as we left port. The nearer bridge is the MacDonald Bridge, while in the far background one can make out the MacKay Bridge. Halifax's skyline, again as viewed from my ship. 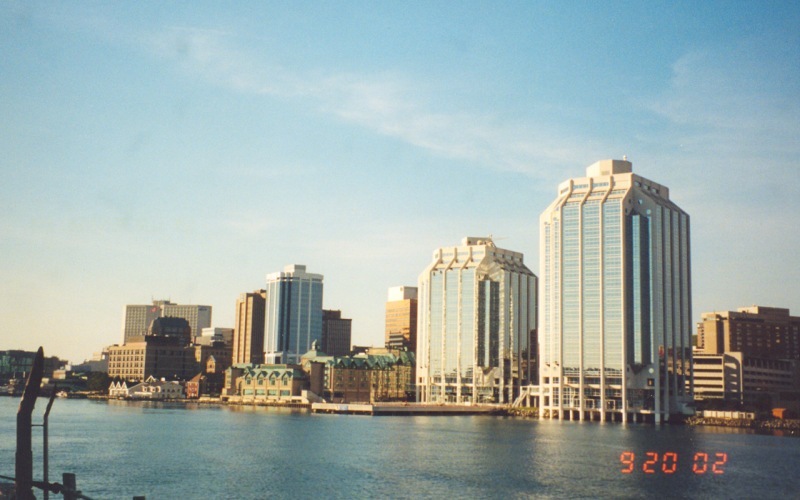 The two towers in the right foreground are part of the Casino Nova Scotia complex.